Some of you might remember, I broke some news about the NBA Players Association’s search to replace Billy Hunter earlier this month. Yay for me. Bloomberg confirmed my breaking news story about Domonique Foxworth being a candidate through its own sources, so it should be pretty obvious that I have an inside source here. Lucky me. Well, I’ve learned more about what’s happening with the search and let me tell you, it makes me sick. I know that might seem a little funny to say because I have zero vested interest in this. It makes me sick because the players are gonna get screwed if they don’t get their act together. I said this already, but I’ll reiterate, some of you might be thinking, boo hoo to millionaire NBA players…well, I’d rather see the players get the money than the greedy owners. Owners drive me nuts. When I heard Foxworth was one of the final candidates, and did the research to figure out that someone’s desired soft landing was behind it, I thought it was just one guy looking out for himself. It happens. But it turns out it’s much worse than I thought. First, the search process has gone from orderly to a disaster. They had four candidates that were announced the “finalists” for this job. Since then, they’ve expanded the process, reached out to a bunch more potential candidates and they’re scheduled to conduct several more interviews this week. Aren’t they supposed to get a new Executive Director in place on or near All-Star weekend? Isn’t that just two weeks away? How is that enough time for the Exec Committee to vet a whole new list of candidates? What’s really going on here? So why are they blowing up the process so late in the game and injecting a bunch of new candidates, many of whom, I’m told, have absolutely no business getting this job? The players are getting sidelined and the search firm and the other people that want money from the players have taken over. That’s the sad part. Listen up, because, we, as basketball fans don’t always think like this, but it’s part of the players’ eternal struggle. They trust people to help them, to do what’s best for them, and those people end up frothing at the mouth to take their money. Agents, business advisors, hangers-on; the players put their trust in these people, but greed and jealousy take over, and the players get hurt by the very people that are supposed to be looking out for them. Right now, the players have put their trust in Bob Reilly, Jr. of Reilly Partners, the search firm that’s “helping” the NBPA with this search, in Ron Klempner, the former General Counsel and current interim director, and a handful of other lawyers and consultants. And you know what? I’m not going to pretend to know exactly what each one of them is doing or how this is going down. I don’t know, so I’m not going to make accusations. But I am going to ask the players on the Executive Committee a few questions. Questions that might make them think twice about what exactly is happening in this search right now. Yes, I’m talking you guys: Chris Paul, Willie Green, Steph Curry, Steve Blake, Andre Iguodala, Matt Bonner, Anthony Tolliver, James Jones, and Roger Mason Jr.
You identified some good candidates in this process, right? How many of those candidates are still in consideration? Does Reilly Partners get more money if the person that’s chosen as Executive Director is a candidate Reilly Partners identified and not from the pool of candidates that you identified? Do you feel that Reilly Partners was downplaying candidates that you identified and up-selling the candidates they identified? Let’s talk football. When the Executive Director of the NFLPA was chosen, did Reilly Partners get paid extra if the candidate that was chosen was one they identified? Did the NFLPA name an Executive Director that was seemingly less qualified than the other candidates and knew far less about football than the front-running candidates? Do you see a pattern emerging from how Reilly Partners runs their sports union searches to maximize their own profit and not necessarily get the best candidate? Are qualified candidates mysteriously getting cut behind your back and you only find out about it later? Are the candidates that are being interjected into the process now remotely qualified? Do they know the NBA and do they have the ability to make the NBPA the organization that it should be over the long run? The consultants and the lawyers that are working with the NBPA now have reason to not want a new Executive Director to be named, right? I mean, there’s a pretty decent chance the new Executive Director hires his own consultants and lawyers and gives the old ones the boot, right? Here’s the thing, Executive Committee dudes… this is your union. This is your league. Those are serious questions. Think about ’em… do you think the consultants and lawyers are listening to what you want and doing what’s best for the NBPA? Or are they looking out for their own interests? Hasn’t that happened too many times to you and to every other NBA player? Take a freaking stand against these clowns. You’re the talent, you’re who we, the fans, watch… not because of those other jokers. No more Billy Hunters. No more people looking to make money off you and take money from you. We’ve seen He Got Game. We know how this story ends… it’s time to start a new chapter in the NBPA. Turn the page. Flip the script. Anybody who isn’t looking out for your best interests needs to go. Take back the process from those who want to hijack it for their own financial gain. There’s a fork in the freaking road, one that leads to fat pockets for ‘them’, and one that leads the NBPA to new heights. It’s your time in the sun; make it count. Players around the league will thank you. Future NBA players will hail you as heroes. William Wallace-type stuff. 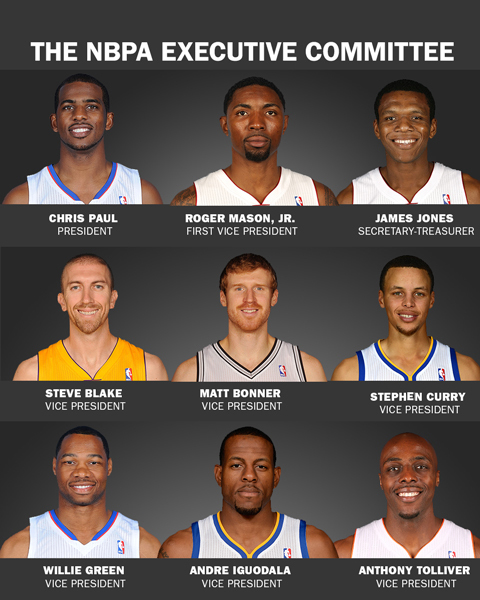 This entry was posted in Basketball and tagged chris paul, Executive Director of the NBA Players Association, NBPA. Bookmark the permalink.